The purpose of the GLAC is simple – we advocate for responsible gun legislation. President Obama has already put the framework in place with the "Now Is The Time" Plan, which includes strengthened background checks for all gun purchases, the closure of existing loopholes, increased access to mental health services and prohibitions on high-capacity magazines and military-style assault weapons. 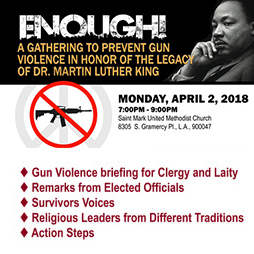 The GLAC welcomes the membership and participation of all Temple Isaiah congregants and all of those outside the Temple walls, who share the passion to further our goals of reducing gun violence through community action and legislative advocacy. Join Temple Isaiah Gun Legislation Advocacy Committee, Women Against Gun Violence and Violence Prevention Coalition of Greater Los Angeles. Our task is to show all of our elected representatives that supporters of common-sense gun legislation vastly outnumber those who oppose it. Thus our voices should be given the same respect as those of the gun lobby. But we need your help to make this happen. Please contact Karen Sloane at templeisaiahglac@gmail.com to get involved. In the wake of the mass shootings in Aurora, Colorado and Newtown, Connecticut, a core group of Temple Isaiah congregants invited the entire Temple membership to engage in a conversation exploring how they, acting upon Jewish values, could advocate for responsible legislation to reduce gun violence. Discussion participants overwhelmingly supported a proactive approach, and the Gun Legislation Advocacy Committee (GLAC) was born. Under the leadership of Chair Karen Sloane and advisor Rabbi Dara Frimmer, the GLAC drafted a plan based upon principles reflected in our Judaic texts and Temple Isaiah's long tradition as a social justice congregation. This proposal was presented to the Temple's Board of Trustees in March 2013, where it received a unanimous vote of approval, establishing the GLAC as the first synagogue-based organization of its kind in Los Angeles. Successful lobbying efforts require broad community support. As a result, the GLAC is in the process of building coalitions with a diverse group of neighbors across the city, which includes interfaith and non-sectarian organizations, as well as other synagogues. Ultimately, we believe that we can match and exceed the passion of those who oppose common sense firearm regulations. As Rabbi Eric Yoffie, Past President and President Emeritus of the Union for Reform Judaism said, "what we need to do is go on the moral offensive, and send the message to our legislators that we care deeply about this issue and will hold them accountable." Below are a number of actions you can take to help support responsible gun legislation. 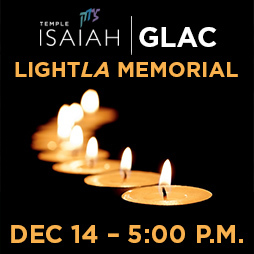 Join our GLAC Group on LinkedIn “Temple Isaiah Gun Legislation Advocacy Committee”. LInkedIn group members can “share” recent news articles and post meaningful messages. We would love to have you engaged!